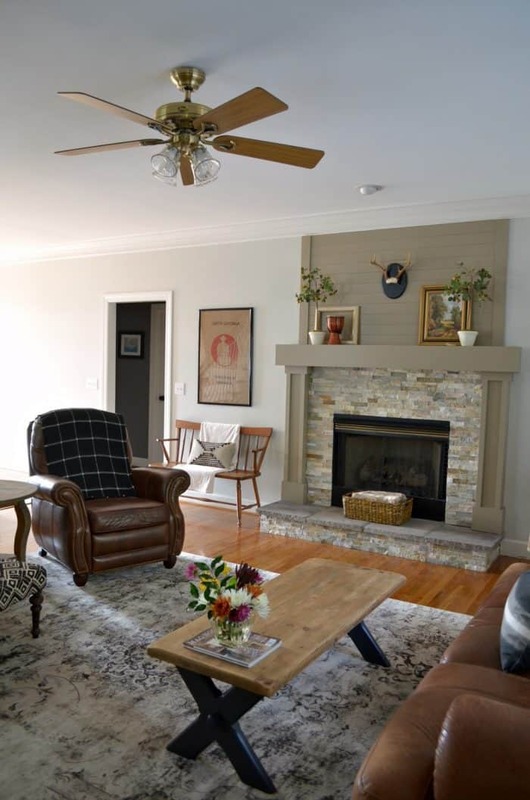 Thank you all so much for all of the sweet compliments about our Family Room Makeover that I shared on the blog yesterday. To keep this makeover affordable I tried to think about what I could keep but make look better. 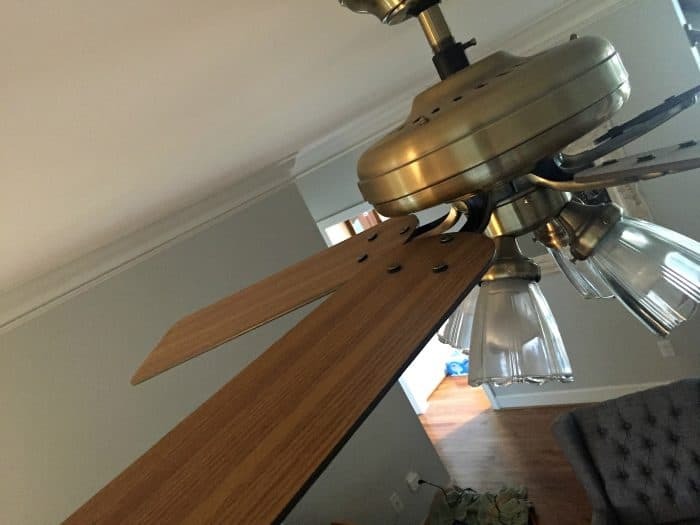 The ceiling fan update was one of those projects. There are many people who do not like ceiling fans. We are a ceiling fan family. We like the extra light as well as running the fan. I searched for about 3 days for a new ceiling fan. As it turns out I still liked the style of fan I already owned. I kept choosing very similar fans. 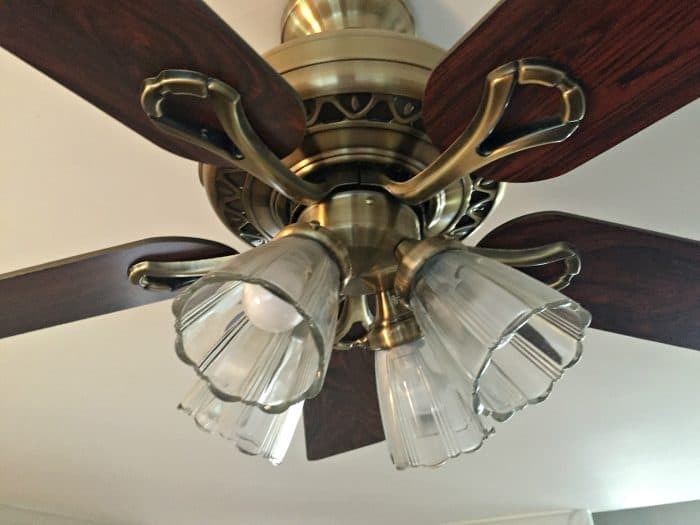 There was no need to spend money for a new fan when a ceiling fan update would work just as great. Here is what the fan look liked the entire time we have lived in our home. Basic, dark cherry blades and lots details on the glass globes. The fan I own is a Hunter so it’s a quality fan. After thinking it over, I had a light bulb moment about the blades. These blades come reversible but since the fan was in the house when we bought it I didn’t know what the blades looked like on the other side. I climbed up to check out the color of the blades on the reverse side. The lighter oak would be the perfect compliment to our new room. I also bought new glass globes. They were $5 each. I went with a less fussy more casual globe. I thought these would look good with our decor. There are several glass globe options at the home improvement stores. Changing the blades was super easy. There were three screws holding each blade on. This is a great time to really clean the fan. Mine was a hot mess. It’s much easier to clean each blade when you remove them to flip over. I actually gave the brass a good cleaning too. Now it looks brand new. I need to buy one of these dusters to keep it clean. 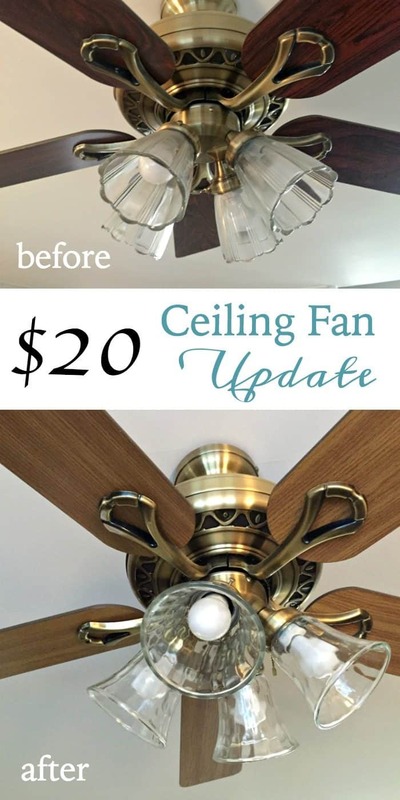 Easy projects like this ceiling fan update are perfect for someone who want’s a new look at an affordable cost. 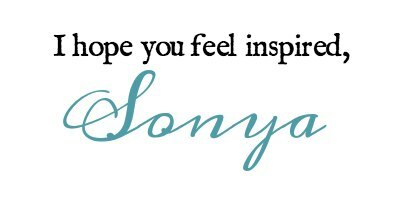 It helps me so much when you share my blog post on social media somewhere. I would love it if you would Pin this photo to one of your Pinterest boards. You can click on this photo to Pin It or scroll back to the top of the post and share from there. THANK YOU for your support. Great update! 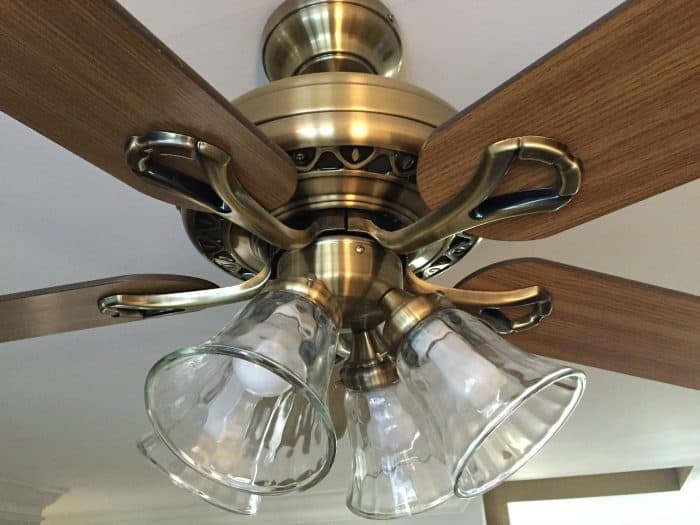 I too, have been wanting new ceiling fans, but when the ones you have work fine, it is hard to justify the cost of a new one. Thanks for sharing. Beautiful!! I love your mantel especially! You have a powerful creative mind. I love your makeover. You have very good taste. Well thank you so much for saying so!